Pierrefonds – Is this your cat? He or she has been coming around since August 2014. He’s now a permanent guest in my cat shelter. He’s beautiful. The first year he would come around and he had a beautiful clean coat of hair, so I’m sure he had a home. But since the summer his white paws are now dirty and his coat matted. He’s here all the time and looking sadder and sadder. 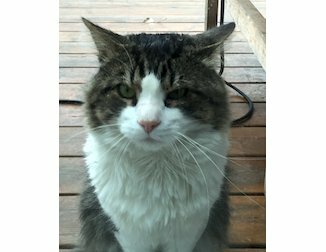 Could I see more pictures of the cat please, my friend lost her cat and it almost looks the same. Hi cj, it’s best to contact the announcer directly at Katevaxo[at] gmail[dot] com. (This cat has been stray for awhile.) You could also post an alert for your friend’s cat, if it hasn’t been done yet!